Measuring the actual cost of procuing technology equipment could be tricky if the correct principles and calculations are not considered. The right way to calculate this is by considering the time value of money with an after-tax, net present value analysis. Basic arithmetic alone (i.e., payment multiplied by term) will lead you to an incorrect value. The financial concept of time value of money is based on the reality that money available at the present time is worth more than the same amount in the future. This is due to money’s potential earning capacity; earning interest over time or providing a return. Net present value (NPV) is another financial analysis concept building on the time value of money to measure the true cost of a payment or payment stream. CFO’s and financial decision makers evaluate different solution procurement options by comparing their NPVs. The various options of procurement (cash purchase, lease, etc.) consist of cash flows and potential tax deductions occurring at different points in time. A net present value calculation is made for each procurement option representing its actual total cost in today’s dollars allowing a true apples-to-apples comparison across all payment options. 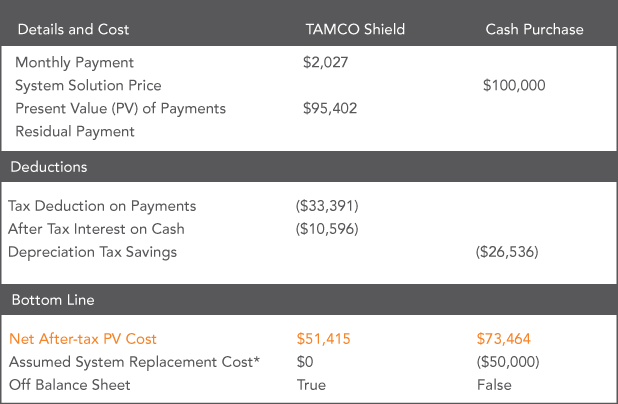 Financing with TAMCO’s OPEX product, TAMCO Shield, assists businesses that are concerned with preserving capital and credit lines for growth. The comparative analysis below serves as a means to measure the net present value after-tax cost of all financing options presented. * Solution Replacement Guarantee and “Act of God” Coverage are both guaranteed in writing with complete details and requirements outlined in the customer contract. Proposed quotes are subject to expiration. Assumption above based on a complete system replacement at midpoint of term. Quotes and program options are subject to change pending a formal credit and scope of work review. Monthly payments are pre-tax and based on upfront payment of first and last month upon contract execution. This analysis was prepared using accepted financial and accounting principles considering the “time value of money” and the following assumptions: Present Value Discount Factor = 10%, Annual Inflation Rate for Maintenance = 4%, Federal income tax rate - 35%, Straight-line depreciation - 5 years, Interest Rate on Idle Cash = 4%. Many businesses spend their precious capital to buy new technology, but this can prove to be more costly in the long run when compared to monthly payment options like Shield or traditional leasing. Shield enables you to invest your cash into revenue producing and/or appreciating assets instead of spending it on technology that loses a significant portion of its value after installation while at the same time, giving you the peace of mind that other payment options cannot. Simply put, TAMCO Shield is purpose-built to address business, financial, and technology concerns facing companies in today’s ever-changing marketplace.